We have a thing for cute shops. Especially ones that are filled with bright blooms, female-owned and have a blush pink storefront! We took a trip to Charlestown and held our Intro to Modern Calligraphy class at the sweetest shop, Junebug. For those who haven’t heard of it before, it’s a full-service florist and gift and plant boutique, and it’s by far the prettiest shop on the whole street! We had the best time sipping prosecco, chatting and lettering with everyone who came. It was so nice to see how connected the Charlestown community is considering most of the attendees were locals. We couldn’t help but do a little holiday shopping ourselves while we were there. From the market bags, (Jess’ personal favorite!) to the jewelry, candles and potted plants, there were so many cute items lining the shelves! It may be 2019, but we are still swooning over photos from this class, and are already planning our next trip in! To be the first to know about upcoming classes and all things Sip & Script, sign-up for our newsletter and head on over to our events page to see where we’re going next! Dec 30 Easy NYE Party Decor Idea & A Happy 2019! You all know how much we like to drink champagne and write pretty things around here! Today we are literally doing just that in this easy DIY video to make your bubbly tomorrow night extra festive. Why not class up your plastic cups with some letters honoring the best part of the night: the countdown! Check out our video here! All you need are the cups and an acrylic paint marker. We found these glitter cups at Target, not in the holiday section but in the regular party aisle. One of our favorite pens is the DecoColor brand acrylic marker, which we found to write better than Sharpie’s for this. You can use these markers for any project (wood, chalkboards, glass, etc) and can pick them up at any A.C. Moore or Michaels. If you’re staying in tomorrow (like us!) it would still be fun to add the countdown cups to your bevvy’s for New Year’s Day brunch, too! We’ve never met a lettered mimosa we didn’t like! 2018 will be pretty hard to beat, but we are so looking forward to a fresh new year lettering with you all and bringing you more fun projects! We cannot thank you enough for your support of this team of ours! Cheers to a creative New Year! Dec 16 SIP & SCRIPT TAKES MIAMI! It’s been a busy December over here at our Sip & Scrip HQ! We turned three, we reached another state (CHICAGO! ), our squad has grown, and we aired on our first LIVE TV segment! So naturally, with all of these major accomplishments happening, we celebrated in style by heading to Miami for the Create & Cultivate Vision Summit. And of course for some MUCH needed sun, salt water, and rosé sails! 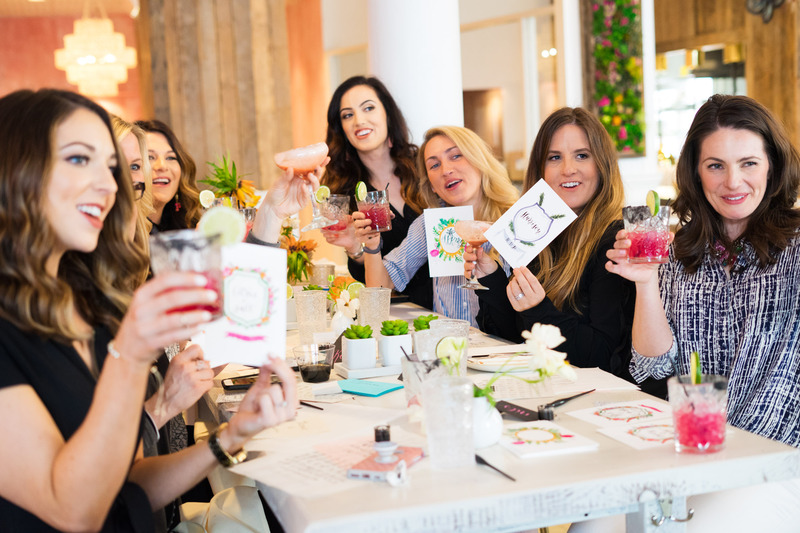 The C&C Vision Summit was the most insta-worthy, foodie-approved, girl-boss-powered event, and we’re still buzzing with inspiration! We spent the day learning from some of the most successful and inspirational women who spoke on topics such as the power of positive self-talk, building a brand, handling failure and valuing yourself. Our biggest takeaways from the weekend? For starters, Venus Williams is a total badass. When asked about what truly drives her, she responded with, “well, I hate losing.”…Same girl, same. But most importantly, as women, we need to start recognizing our accomplishments and continue to show up for ourselves and our businesses. Oh, and that we DEFINITELY see a Sip & Script boat in the future! We can’t wait for all that is to come in 2019! Wishing you a happy and healthy holiday season!